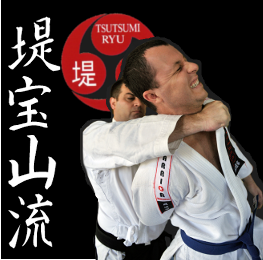 At Self Defence Central Dojo, we teach the art of Tsutsumi Hozan Ryu Jujutsu as taught by Shihan Hans De Jong, which has been passed on to him by his father Shihan Jan De Jong. In this three part article, we will explore the achievements and views of Shihan Hans De Jong, who has spent the last 60+ years living the martial arts and continues to this day to share as much of his extensive knowledge and experience with anyone who has the good judgment to listen. 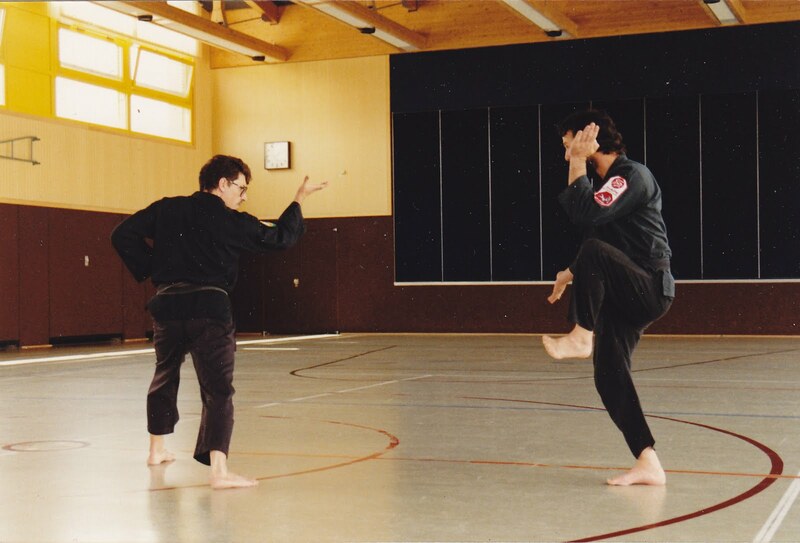 Hans has been teaching martial arts, primarily Jujutsu and Aikido, as a full-time professional instructor since 1974. He has taught and held seminars nationally throughout Australia as well as internationally, in the Netherlands, Germany, Belgium, Norway, Sweden, Denmark and Indonesia. Hans has taught the Special Air Services Regiment (SAS) with his father Shihan Jan de Jong, at the head-injured society, senior citizen groups, women’s self defence courses, high school self defence courses, self defence / risk and anger management to the fisheries department and even at the academy of performing arts. With his extensive history with the Jan de Jong Self Defence school and a total of 40 years of teaching experience Hans has an encyclopaedic knowledge on the evolution and structure of the Tsutsumi Jujutsu self defence system still taught today containing traditional Tsutsumi Jujutsu (a contributor to Kano’s Judo syllabus in the early 1900s) with additions and enhancements from Yoseikan Budo and Suci Hati Pencak Silat. Hans was born in Semerang, Indonesia, and emigrated to Perth when he was about two years old. He commenced his training in 1955 at the age of six, being introduced to martial arts “as soon as he could walk”, by his father. He was among the first instructors in the Jan de Jong Self Defence School to be graded black belt by his father. Hans also obtained Dan grades in Yoseikan Aikido and Shotokan Karate, in addition to studying Pencak Silat, Escrima and Taekwondo through his extensive career. In the early 1960s when Hans was around fourteen he was accepted into the ‘closed-door’training sessions for Pencak Silat. At that time you had to be at least 18yrs old and hold a green-belt in Jujutsu before you could join these sessions. The Pencak classes were not open to the general public and as Hans was too young at that time, Shihan Jan de Jong asked the other members for their permission. Interestingly, there were no belts or grades in the Pencak Silat taught by Shihan Jan de Jong at this time either and students simply trained to learn the art. In 1964 at the age of fifteen, Hans travelled to the Netherlands to continue his education and after he left school he enlisted in the Army for two years, returning to Australia in 1973. Whilst in the Netherlands Hans trained in Taekwondo. The following summarized account from Sensei John Coles blog site, Kojutsukan provides interesting insight into this Instructor, Sensei Yoshiaki Unno, who on his assignment with the Jan de Jong Self Defence School trained several of the current Perth instructors still teaching Yoseikan Karate and Aikido today with their own successful martial arts schools; ref . Yoshiaki Unno is a fascinating off-shoot from the Jan de Jong story. The photograph to the right is a rare photograph of a young Unno presenting Branco Bratich with his 1st dan certificate in Yoseikan karate in March 1976. 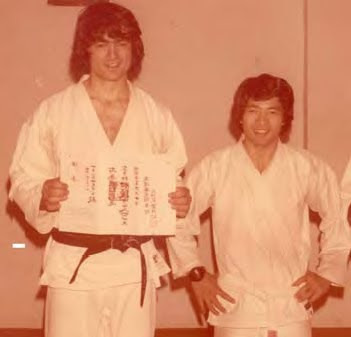 After De Jong returned from Japan in 1969-70, he asked Minoru Mochizuki to send an instructor to Perth. Mochizuki sent Unno who was a personal student of his, and a seriously credentialed martial artist. He’s been credited with 6th or 7th dan Yoseikan aikido, 6th dan Yoseikan karate, 6th dan jujutsu, 5th dan kobodo, 5th dan iaido, 4th dan Nihon den kempo (Takushoku University), 4th dan Shotokan karate, and 2nd dan judo. Unno was born in February 1950 and arrived in Perth in 1974. He is known for teaching aikido and karate for De Jong, however, some students of those classes have said he taught an eclectic mix of martial arts in the Yoseikan Budo tradition. Sensei Unno taught six days a week for Jan de Jong. Wherever Sensei Unno taught, Branco was there to assist and learn. It was under Unno Sensei that Branco first studied kobudo and aikido and dabbled in judo. 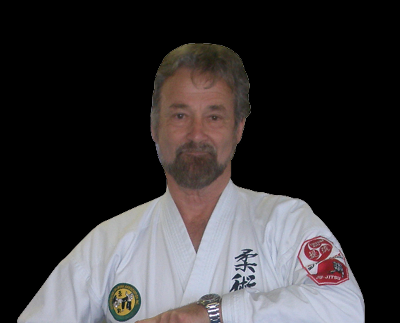 Bratich (8th dan) has built Yoseikan-ryu Karate Australia into an Australia wide organisation. He opened his first club in 1978. His introduction to karate started in 1973 at Jujutsu Kan, Perth (De Jong’s school). The article states that his initial interest was in karate closely followed by jujutsu. It also states that in later years he realised that the jujutsu training made it easier for him to understand and appreciate the ‘bunkai’ of kata. After two years training, Jan de Jong, founder of Jujutsu Kan, approached Branco about teaching karate and Branco accepted becoming increasingly aware of his great enjoyment of teaching karate even though he felt his knowledge was limited. What karate? I asked Bratich was it Shotokan karate or was it pencak silat. He said it was pencak silat although De Jong called it karate. It was in the latter part of 1976 that Sensei Unno opened his own Yoseikan Budo dojo in William St Perth. It was a small dojo. The training was still rigorous. It was surprising that any student would let them self be subjected to the brutal kumite training that was done in those days. Unno also taught aikido at the University of Western. Many aikido instructors in Perth reference training under Unno in their biographies. 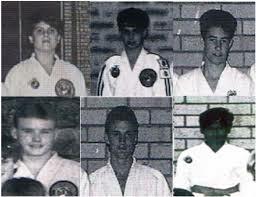 Both De Jong and Unno have had a significant influence on the martial arts scene in Perth. Shihan Unno passed away in June 2006. The second part of this three part article will explore Shihan Jan De Jong and Shihan Hans De Jong’s involvement with the Australian Ju-Jitsu Association.